Connecticut is a New England state of the northeast United States. There are many famous Native American tribes who played a part in the history of the state and whose tribal territories and homelands are located in the present day state of Connecticut. The names of the Connecticut tribes included the Narragansett, Mohegans, Wampanoag, Nipmuck, Pocumtuck, Abenaki and Pequot. The French and Indian Wars (1688 - 1763) was a generic names for a series of wars, battles and conflicts involving the French colonies in Canada and Louisiana and the 13 British colonies, which included Connecticut, consisting of King William's War (1688-1699), Queen Anne's War (1702-1713), King George's War (1744 - 1748) and the French and Indian War aka the Seven Years War (1754-1763). Various Connecticut Indian tribes were allied to the French and British colonies during the French Indian Wars which raged for nearly 75 years. The climate, land, history, environment and natural resources that were available to the indigenous Indian tribes in Connecticut resulted in the adoption of the Northeast Woodlands culture. Geography, Environment and Characteristics of the State of Connecticut: Narrow lowlands and hilly eastern upland. 1675: 1675-1676 - King Philip's War. so named after Metacom (King Philip) of the Wampanoag tribe, who was called Philip by the English. 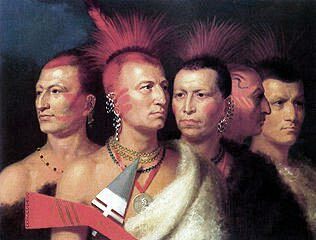 The war was bloody and bitterly fought by the colonists against the Wampanoags, Narragansetts, Nipmucks, Pocumtucks, and Abenakis.The Narragansett tribe were nearly exterminated during this War. The history of the European invasion brought epidemic diseases such as tuberculosis, cholera, influenza, measles and smallpox. The Native Indians of Connecticut had not developed immunities against these diseases resulting in huge losses in population. Exploitation including the leverage of taxes, enforced labor and enslavement were part of their history, taking their toll on the Connecticut Indians.